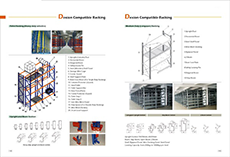 Industry longspan shelving is one of warehous storage system. It have steel shelf or wood shelf to put pallet. The system was named by loading capacity. The loading capacity for industry longspan shelving is about 500-1000kg/level, which is higher than light duty shelving and family use shelving. 1. Racking post is made from special cold rollled and formed steel, there is holes in the front and side of post. Front hole is used to connect with step beam. Side hole is used to connect horizontal and diagonal bracing of frame. 2. Beam use P profile beam which is also called step beam, the height of step is the same with shelf height. 3. Steel shelf or playwood shelf is available for industry longspan shelving. Four side of steel shelf all have bending. 4. Safety pins is used to prevent beam from jumping out when hit by forklift. 5. Steel base plate is available to fix the shelving system into ground. Industry longspan shelving is adjustable by 50mm. It’s easy to install and relocation, don’t need special tool to assemble it. One bay of industry longspan shelving have 2 upright frame and 6 beam + 3 steel shelf. This is called start bay, add on bay means the shelving bay only have one upright frame which need to use the frame of last shelving bay. Industry longspan shelving is widely used in mechanical, electronics, textile, garment, metal, mine, beverage, food industry.